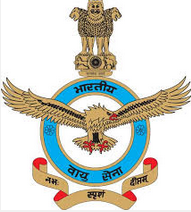 Indian Air Force (IAF) invites applications from eligible Indian Citizens for direct recruitment of following Group 'C' Civilian posts for filling up 45 Vacancies in IAF at HQ Central Air Command Units. The closing date for submission of applications is 28th May 2016. 12th Pass or equivalent. Must possess a speed of 35 w.p.m in English typing or 30 w.p.m in Hindi typing on computer (35 w.p.m and 30 w.p.m correspond to 10500 KDPH/9000 KDPH on an average of 5 key depressions for each word). Matric pass or equivalent. Must be holding a valid certificate of the trade professional skill from ITI in the trade professional skill. Matric pass or equivalent with six months experience in trade. Matric pass or equivalent qualification. Matric pass or equivalent. Experience in the trade for six month. Matric pass or equivalent and experience in the trade. Age Limit: 18 to 25 years (except LDC / Hindi Typist post) as on 28 May 2016. For LDC / Hindi Typist is 18 to 27 years as on 28 May 2016. The age relaxation of 05 years for ST candidates and 03 years for OBC candidates is admissible. Age relaxation for Physically Handicapped (PH) is admissible as per the rules in vogue. Selection Process: Written Examination. The Exam test scheduled to be held on 24th July 2016 by the respective AOC/ Stn Cdr/ CO.
How to Apply: Application forms duly typed on A-4 size paper as per the prescribed application format along with Self-attested photocopies of required documents to be addressed to the Air Officer Commanding /Station Commander/ Commanding Officer of the place of vacancy at unit address. The Application should reach to addressee on or before 28/05/2016. Envelop containing the application form should be marked clearly on the Top "APPLICATION FOR THE POST OF _______".